These one-stop sites have reliable information on citation styles, writing processes, specific genres, and grammar & mechanics. With their permission, we link you directly to them. Walden University makes all their recorded webinars available for use by all. Watch more than 40 webinars on topics from achieving flow & cohesion to synthesis and analysis to writing literature reviews. Don't want to browse? Click here for our curated list of resources on specific topics. The Library at DU is your one-stop-shop for all things research. There are hundreds of research guides as well as workshops offered quarterly (there are recorded ones too). You can also ask quick questions or schedule a research consultation. Using English is a great resource for English Language Learners. It has all sorts of content including English idioms and articles. 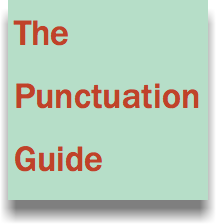 The Punctuation Guide is an easy (and well-designed) way to learn punctuation. The Plain English Campaign has put together a list of academic words and their plain English counterparts. Check out the A to Z of Alternative Words here! The Academic Phrasebank lists common academic phrases. It can work as a thesaurus is you find yourself using the same phrases over and over.